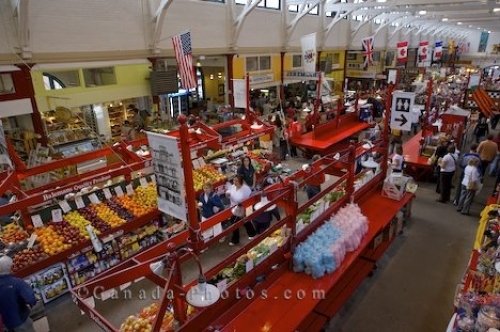 From the upper floor of the City Market in Saint John, New Brunswick, you can see the many stalls filled with fresh fruit, meat and vegetables. In this building which is home to the City Market in the downtown core of Saint John, New Brunswick, there are stalls that are full of a wonderful display of food and goods. Many locals come to the City Market to pick up their regular groceries as they are much fresher and the cost is less than the big grocery stores. Market Stalls inside the City Market building in downtown Saint John, Bay of Fundy, Fundy Coastal Drive, Highway 1, New Brunswick, Canada. City Market was built between 1874 and 1876. Picture of a variety of goods for sale at the stalls in the building of the City Market in Saint John, New Brunswick in Canada.